Dzidra Ezergaile (1926 – 2013) – a small, thin woman of very delicate build with a back bent by the load of years, but always wearing a good-natured, sincere and warm smile and having a radiant glance – she belonged to the generation of artists who prospered during the complicated post-war years. The artist went through a long, interesting and creative life, facing a lot of challenges and difficulties, but stubbornly and purposefully devoting herself to art. After graduating from Riga Secondary School No 2, Dzidra Ezergaile entered the Faculty of Architecture at the University of Latvia, where she studied for three years until in 1951 the faculty was joined to the Faculty of Engineering (later, though, it was reinstated again). As she did not wish to study with engineers, she entered the department of graphic art at the Art Academy, which as a reserve variant (if she had not been enrolled in the faculty of architecture) she had had in mind since the very beginning of her studies. In order to acquire all techniques in graphic art, she had to start her studies in the academy as a 1st-year student again. Just after the graduation from the academy she was offered a designer’s job in the editorial office of the journal “Padomju Latvijas Sieviete”, and she had meritoriously done it until she retired. However, every free minute Dzidra Ezergaile could find out of the official working hours was spent on creating graphic art works, basically in the techniques of etching, wood-cut and linocut. Works created by the artist can be seen in many museum and private collections. The central leitmotif of her works is nature expressed through folk songs and forefathers’ sense of nature. Despite the fact that the method of socialist realism prevailing in the Soviet times demanded of all artists to glorify the happy life of Soviet people, Ezergaile never complied with these standards, taking refuge in the heritage of the ancient times of the Latvian nation, in the poetic sense of nature which in most cases materialized as landscapes and still lives. 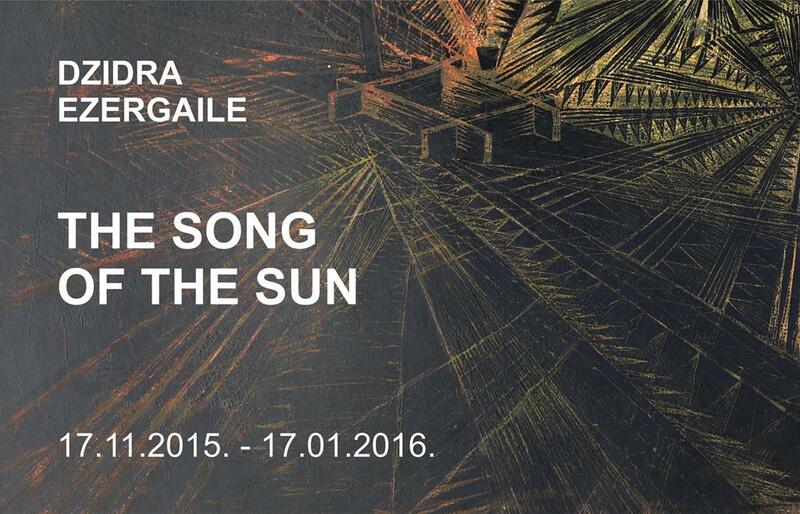 The poetics expressed in folk songs and the Sun as a symbol of motherly love, light, warmth and supporter of life have often been the central images of artist’s works, typically having strong, rational rhythm of lines and compositions which remind us of the foundations of Dzidra Ezergaile’s architectonic thinking. “Song Rhythms”, “The Little Sun”, The Circles of the Sun”, The Sun’s Way”, “A Well”, “A Mill”, “Folklore Motifs” – are a few titles reflecting the artist’s legendary thinking, moving to the foreground the awareness of Latvian identity through the simple archetypical images of folksongs. This form of expression and thinking had been organic for the artist since her early childhood when she spent summers close to nature observing its rhythms, listening to birds’ songs, sounds of the wind, splashing of water, and from the warm sunrays receiving love and energy of the nature, which, in her turn, she could share with others till the very end of her life. The forefathers’ life wisdom, passed down from generation to generation through folksongs as the summary of collective archetypical consciousness, keeps strong ties with eternity. Reduced to simple forms (the sun, moon, stars, water, a well, people, trees) this deep knowledge has been visualized in artist’s works, enabling a viewer to come closer to the ancient Latvians’ mythology which is not the embodiment of folk fairy-tales and legends only, but rather the embodiment of general human values.